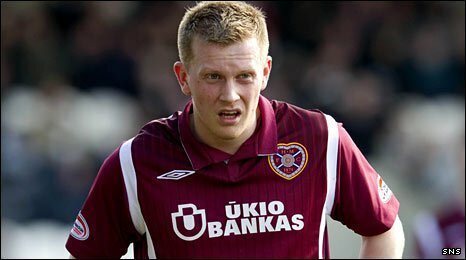 English-born Hearts winger Andrew Driver has expressed delight after a rule change means he is now eligible to play for Scotland. Driver previously fell foul of eligibility rules agreed by the four British football associations. Now, the criteria regarding a player's education have been widened. "I am thrilled to finally get the all-clear to play for the country that I have pledged my allegiance to," Driver told the club website. Previously, players with British citizenship had to either have at least a grandparent born in a particular Home Nation, or have completed at least five years of schooling in that country in order to represent the national side. Driver was born in Oldham and has no Scottish lineage, but moved to Scotland at the age of 11. Although he attended school in Scotland, he did not fulfil the criteria as set out in Fifa's rules which stated that: "the player has undertaken primary and/or secondary education for a minimum of five years in the territory of the relevant association". That disqualified Driver from playing for Scotland. However, on Wednesday the wording was amended to allow players who have "engaged in a minimum of five years' education under the age of 18 within the territory of the relevant association". After leaving school at 16 to sign for Hearts, Driver undertook vocational college courses which qualify him to represent Scotland under the amended rules. The Scottish FA and Scotland manager Craig Levein had examined the possibility of selecting the 22-year-old before they discovered his ineligibility. "Although I was disappointed when it turned out I didn't qualify under the original criteria I never gave up hope," said Driver. "Craig Levein has kept in constant contact since then and I was encouraged when he told me there was a chance the wording would change and that I might yet play for Scotland. "It would be tremendous to be chosen to play a part in the qualifiers for Euro 2012." Levein expressed delight that Driver was now eligible for the national side. He said: "It is great news that as a result of this necessary change Andrew is now eligible under the new criteria. "Hopefully, if he can get back to the form he showed the season before last, he is a player we can look to introduce to the squad for the Euro 2012 qualifiers."